If you wish to cancel or change your reservation, we will require 5 or 10 days advance notice before the date of your arrival, otherwise you will be charged the cancellation fee of one night's stay. NOTE: In case of the less than 4 people group, 2 day advance notice required, which is normal cancel policy. Cancellations made with 5or10 days advance notice or more will not be charged. If you fail to check in as scheduled, we will cancel all your bookings and you will be charged the cancellation fee. Only highschool or junior higschool students can not be accepted. We can not accept your booking unless some of teachers or other responsible adults have to accompany with students. This hostel is mainly for an indivisual backpackers. Facilities such as shower rooms, kitchen and living room has to be shared with other guests. Please care about the effect on other guests when you use these facilities. Conveniently located 3 minutes’ walk away from Takayama station, just opposite the main post office, and within walking distance of major sightseeing spots, including Takayama Jinya, morning markets and old town, J-Hoppers Hida Takayama Guesthouse is a homey hostel providing both dormitory and private rooms of various types, including Japanese-style rooms with tatami-mat flooring, catering to the needs of different travelers, including backpackers, couples, groups of friends and families alike. The reception is open 8:00-11:00 and 15:00-22:00. Check-in time is from 15:00 to 22:00. Please contact us in advance when you plan to arrive after 22:00. No curfew, no lock out time. *All rooms are air conditioned and heated. *Safe lockers found on all floors. All beds in dorm rooms were hand-made by a local carpenter. They are strong, not creaky, wide and kind of private. All beds has partition curtains and bed lights. Air conditioned, of course. There is enough space to keep your luggage even you are on the top bunk. They should be much more comfortable than ordinary bunk beds. 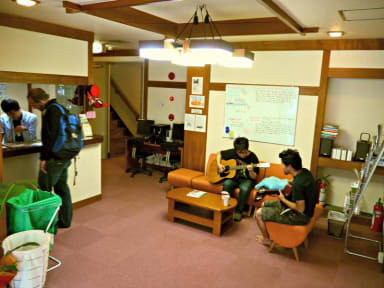 Most private rooms are Japanese style and also larger than normal hostel private rooms. You can enjoy traditional Japanese Tatami mats, Shoji paper windows and Fusuma closets. We give you a stamp for each night at any J-Hoppers Hostels (Kyoto, Osaka, Hiroshima and Hida Takayama) or Hana Hostels (Kyoto, Osaka, Hiroshima and Fukuoka). You will get 300YEN discount or a special coupon on every 3rd night. Our friendly staff will provide you with useful sightseeing information, local event information and how to hang around the neighborhood. We also try to be up to date on what is happening in the area and can give you advice on where to go. Great hostel in Takayama. Of course is everything superclean, and the location is good (Takayama is not a big city anyhow). We did miss a lounge area but that's perhaps not that common here in Japan. What really made a difference was the staff. Super friendly, willing to help and fluently in English! !